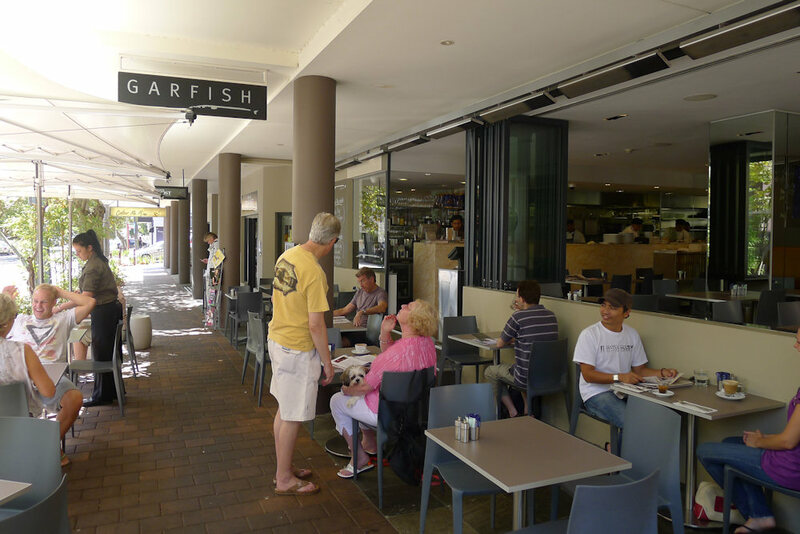 The three Garfish restaurants have become well known on Sydney’s North Shore for their fantastic seafood dishes. Breakfast is Sydney on Sunday’s thing however so I set out to see what their morning menu was like. Garfish is normally exceptionally busy but I was lucky this morning as there were plenty of spare tables both inside and out. We seated ourselves and had water and menus brought to our table straight away which was a good start. The breakfast menu is quite large so it took us a while to choose! Despite the large food portion of the menu, Garfish is decidedly lacking in fresh fruit juices, smoothies and the like. Parkers Organic orange or apple juice ($4.50 each) is available and there are plenty of coffee, tea and hot chocolate beverages available. 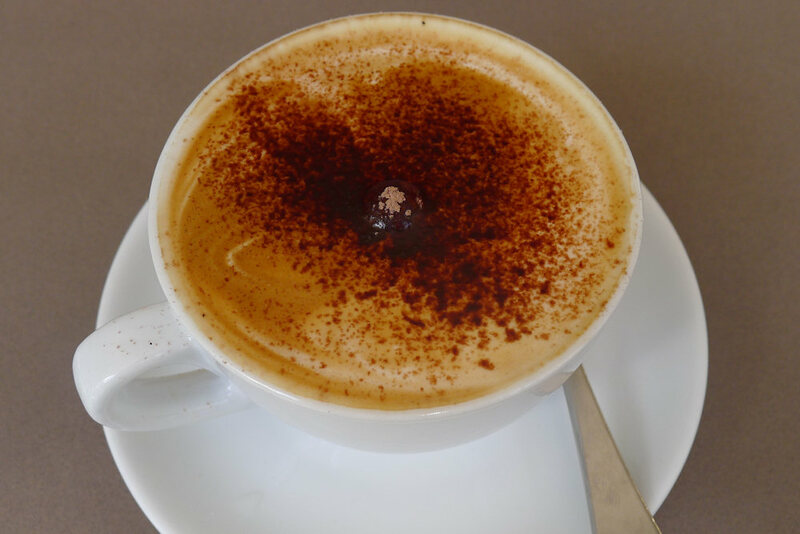 The skim cappuccino ($3.30) left my guest feeling underwhelmed. It was not hot when it arrived and the blend was not anything special. A highlight of the menu was the Belgian waffles (I always read the Belgian part and wonder how authentic they can really be!). They are available with coffee ($6.30 for the two), with maple syrup and a coffee ($7.30 for the two) or as main breakfasts: with poached pear & cinnamon yoghurt, sliced banana & passionfruit curd or bacon & maple syrup ($14 each). 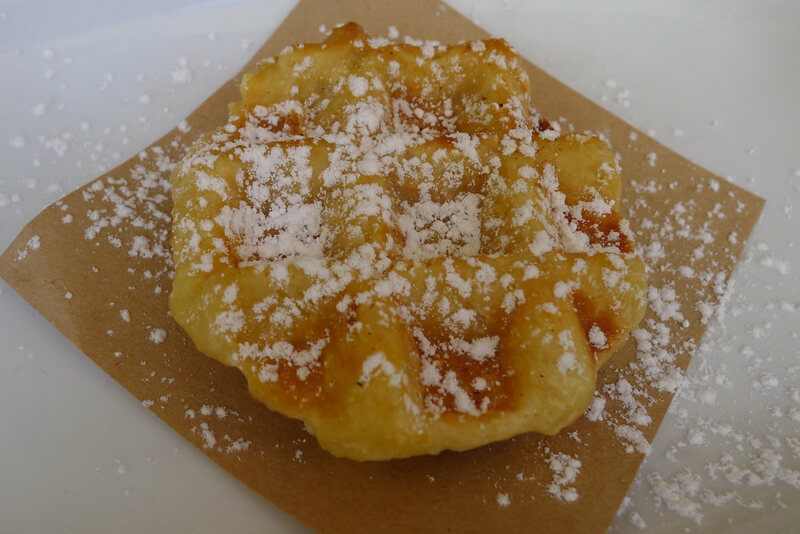 The single waffle we shared tasted fantastic, quite dense inside with a faint liquor flavour, perhaps Grand Marnier. 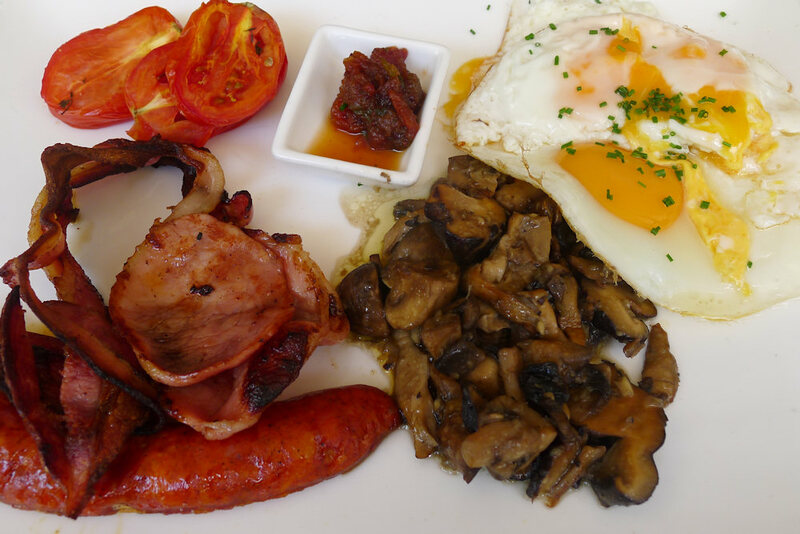 I can recommend this as a small snack but would like to return and try the waffle breakfasts. The corn & chickpea fritters ($16) satisfied on many accounts. The fritters on the bottom were seasoned well and fluffy. They are topped with trim pieces of bacon, roasted tomatoes and “guacamole” which reminded me more of pico de gallo than the smooth paste I would have expected. The guacamole especially was very fresh full of flavour. The lemon in the mixture and the soft avocado brought the whole dish together so I’m happy to give the fritters tow thumbs up! The toast that was served with the Garfish breakfast came with a good portion of butter and was served hot as it should be. 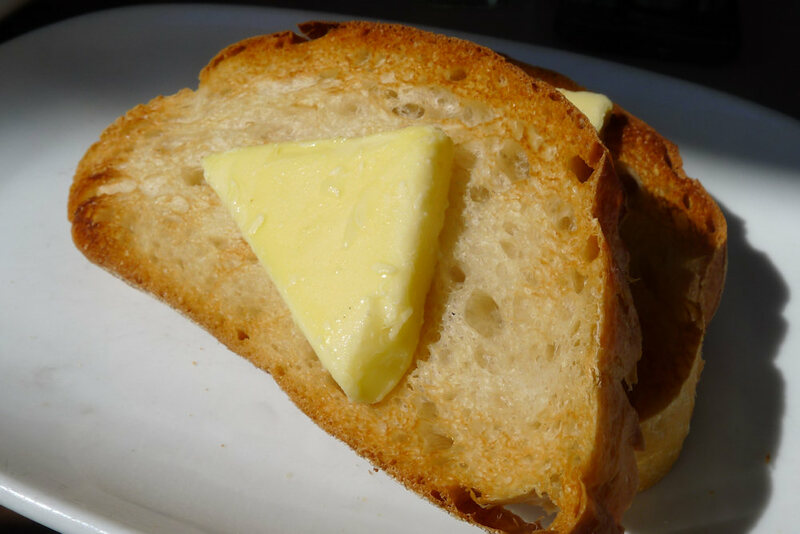 It had a crunchy crust but was not impossible to cut and the bread itself was quite airy and flavoursome. 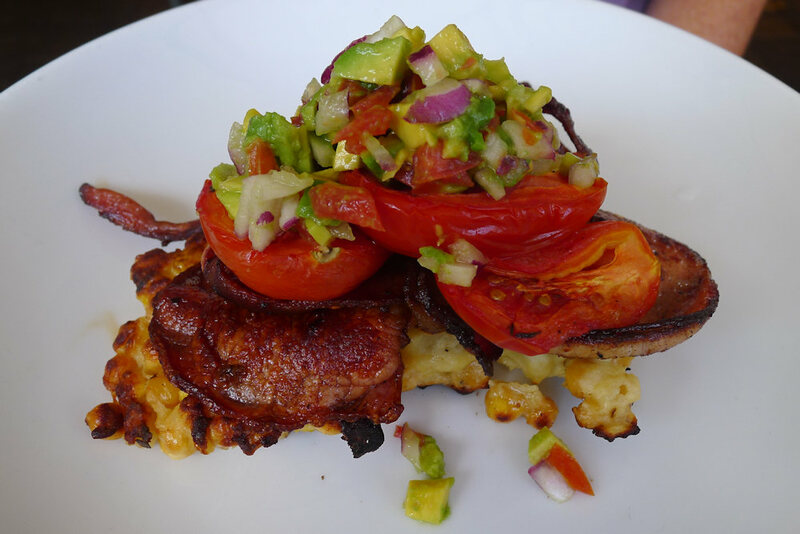 There were numerous things on the Garfish menu that I’d like to go back to try: the waffle breakfasts, spanner crab omelette ($16), toasted raspberry & pear bread with praline butter ($6.50) and bacon, lettuce, avocado & tomato on wholegrain toast with tomato relish ($12). I enjoyed our visit to Garfish even though there were no standout elements to it. It was a good place to relax on a weekend morning – not too many cars, bathed in sunlight and efficient staff. Gluten free bread is available on request. 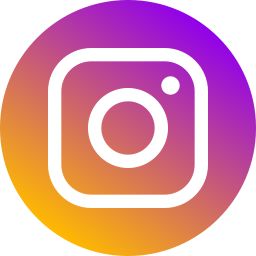 This entry was posted in Sydney - North Shore and tagged Dog friendly, Fresh fruit and vegetable stores close by, Gluten free options, Outdoor seating, Parking close by. Bookmark the permalink.